As I look out the office window, there’s 2 boys about 12 years old racing up and down the street on an electric dirt bike. One drives, the other is pulled along on a scooter, and then they disappear around the corner. A minute later they reappear, having switched driver/scooter positions. They’re hooked together with a spring loaded bungee cord (with metal hooks on the end) which doesn’t seem like the smartest idea, but at least they’re wearing helmets. Plus, it’s entertaining to see the stretch-and-launch style pull the kid on the scooter gets! As I do some searching online, it looks like starter bikes for kids are still around $1000 to $2000 from the big 3 – Honda, Suzuki, and Kawasaki. However, for much less, and more suited to the city driveway and cul-de-sac riding my son would be doing, is an imported electric motorcycle for kids. Prices are in the low-to-mid $100s (not $1000s), and they’re light and simple. Less parts to break, and no carburetor to drain/clean when the winter to spring cycle happens. 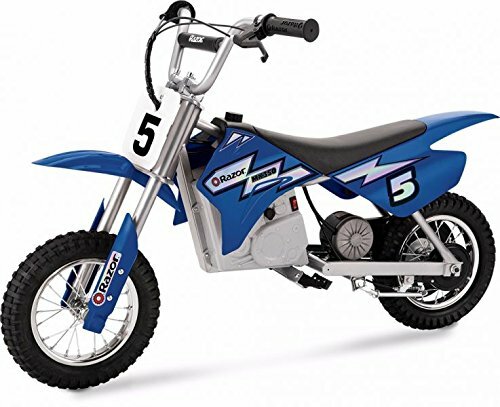 How did we choose the best electric dirt bikes for kids? Choosing the best electric motorcycle for kids is a little different than choosing to buy one for myself. If I was buying one, I’d want the most power for the best price. For a child who’s learning how to ride a motorcycle, however, lots of power isn’t necessarily a good thing. Sure, you want enough power it can take your kid up a hill, but you don’t want the bike to do a wheelie and ride off with your kid falling off the back of the seat! Riding Time With a gasoline powered dirt bike, riding time doesn’t matter. With an electric dirt bike, riding time is a big deal. This is how long the battery will last before your child needs to plug it in and wait a few hours before riding again. Motor Power Depending on the weight of your child, and their experience and skill level riding dirt bikes, more power will be needed. Top Speed Top speed isn’t always important for a child’s motorcycle, but being able to limit the top speed is. Some of the bikes have a key-operated ability to select 2 or 3 different top speeds as your child’s confidence and skill increases. Weight Capacity Make sure the bike can handle your child for a couple years – it’s also nice if it can handle you so you can rip around on it every once and a while without fear of breaking your kid’s motorcycle! Weight The dirt bike should be light enough your child can stand it up on their own if it tips over. Also, lighter bikes cause less injury if they land on your child’s leg or arm during a crash. This bike is dubbed the ‘King of the Hill’ and can actually carry adults – however, it’s recommended for youth age 16 and older so it just makes it into our list of the best electric motorcycle for kids. The MX650 is a few steps above the smaller MX350 and MX400 Dirt Rockets. The motor is a powerful 650 watts which provides enough power to carry riders weighing up to 220 lbs up to 17 mph! Front and rear disc brakes help to stop the bike, and the large 16 inch front tire and 14 inch rear tire help the bike roll over rough terrain and small obstacles without even slowing down. It’s almost twice as expensive as the smaller options, but with features like full suspension and the high torque 650 watt motor, we think it’s worth it. If you’re going to buy a kids motorbike, and your child is old enough or experienced enough for this powerful bike, it definitely gets our recommendation! Please keep in mind this bike goes faster and weighs more (almost 100 pounds) than other comparable bikes, so make sure your child has the strength and experience before turning them loose on it. 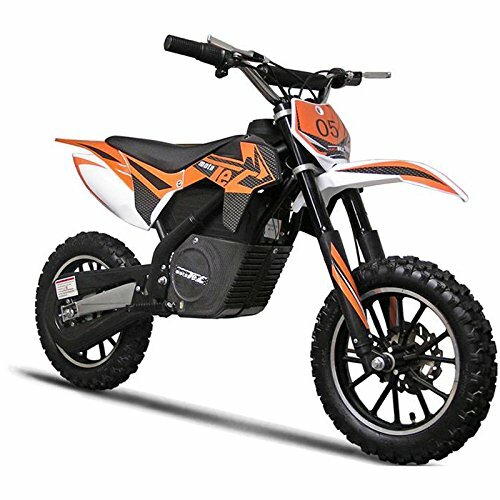 The Mx400 electric motorcycle is a step up from the entry level dirt bikes, and is for slightly older (and/or heavier) kids. Designed for children ages 13 and older, this bike goes a little bit faster and is a little bit larger. It comes with 12″ pnuematic tires to help ride over rough terrain, and has a maximum weight capacity of 140 pounds. For some reason, most reviews of the MX400 compare it to the MX350, and actually recommend people steer clear of this one and get the older MX350. Some of the complaints are the lack of suspension, and a jerky throttle rather than a variable speed like the older MX350 had. However, according to the Razor USA website, the MX350 and MX400 are the same motorcycle, they are just different colors. Perhaps the reviews are comparing an older MX350 with a newer MX400 model which leads to the confusion. This entry-level electric dirt bike for kids comes from Razor, the legendary scooter company. 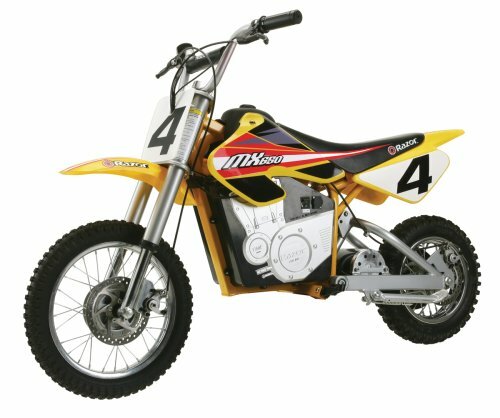 As their entry level MX350 model, this quiet battery-operated moto-cross bike has a single speed, chain driven motor. The authentic twist grip propels the bike, and there is a single hand brake that operates the rear wheel. The MX350 electric dirtbike has 12 inch pneumatic tires with knobby tread. The Moto Tec electric kids motorcycle is a full-featured bike that doesn’t break the bank! With full suspension, and knobby air-filled tires, riding on all sorts of terrain is easy and comfortable. A key-selectable speed limiter makes this bike great for beginners – start with the 5mph settings, and then increase to 10mph or 16mph as the rider’s confidence and skill level increases. Slightly heavier than the cheaper, less-featured EV kids bikes, at 66 lbs this bike is designed for kids 12 and older and can support up to 150lbs. With so many features, this makes our list of the best kids bikes, and with the higher weight limit is even a decently best electric dirt bike for adults! Ride time is officially listed at 30 minutes at full speed, but owners seem to report anywhere from 45 minutes of heavy riding to up to 3 hours of slow and easy riding! Charging the 2-12V batteries takes 4 to 6 hours, although the manufacturer recommends 9 hours. The Pulse Performance em-1000 is a 2 wheeled motorcycle with a 100-watt motor. With a chain drive powering the rear wheel, this electric motorcycle for kids can go up to 10mph (16 km/h). Built with a heavy duty steel frame, the bike is built to last. The front tire is puncture proof, and the rear tire is air-filled to help absorb bumps. 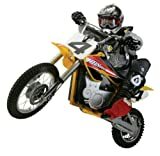 The 10-inch tires help roll over small obstacles or rough ground, but they are not near as stable or comfortable as the 12, or 14 inch tires available on some of the other kids dirtbikes. This electric kids motorcycle has a twist throttle just like the real motorcross bikes, and is designed for riders 8 years and older. Maximum weight capacity is 120 lbs. A full charge on the 24-volt battery is good for about 40 minutes of riding. This is the entry-level option, typically lower priced than the name brand products. From the start, Razor has always tried to provide the best riding experience by using top of the line technology and high quality materials. Since the year 2000, Razor has expanded beyond kick scooters to build all sorts of award-winning products influenced by Southern California. Razor’s Dirt Rocket series takes riders beyond the sidewalk and out into the dirt. Razor incorporates authentic dirt bike frame geometry into a scaled down electric powered dirtbike that has high torque, knobby air filled tires, front and rear suspension, and speeds up to 15 mph. Electric dirt bikes for children are always measured against Razor’s Dirt Rocket line. Electric motorcycles are fairly new so buying one can seem intimidating. Here’s a few things we’ve come up with to help you make sure you make the right purchase – both for your child, and for your bank account! Size of child It may seem obvious, but you want to purchase a bike that is the right size for your child. Where this gets trick is if your child is fairly tall or heavy, but also has no experience with riding a motorcycle or dirtbike. Typically, the larger bikes (with taller seat height and higher weight capacity) also come with more power, so they can pose more of a risk to inexperienced riders. In this case, look for a bike with a speed limiter, or parental control that allows you to limit the top speed to something more manageable until your child gains the skill and confidence needed for full speed riding. Warranty Some of the cheaper options don’t mention any available warranty, and since they have a battery, there are no returns allowed – you’re left dealing with the supplier for parts replacement. Granted, these dirt bikes are cheaper, just keep in mind there is added risk with them. Tire Size Don’t be mistaken, all of these motorcycles are for kids, and they are small. If your child is tall like mine, they’ll have there knees bent way up riding these, but they’ll still have a ton of fun. What can make the small bikes handle much better, even when ridden by tall people (and lightweight adults like me) is to have larger tires. The rotational inertia helps keep the bike upright and in a straight line, and the larger size rolls over small bumps and helps smooth the ride out. Protective Gear These are often listed as toys, but these electric dirt bikes for kids are real machines. They aren’t 2mph power wheels trucks made of plastic. They have sharp footpegs, heavy batteries, and speeds fast enough that running into a tree will hurt! Please make sure at minimum your kids have a good full face helmet. A bike helmet protects the top of their heads if they fly over the handlebars and land on their head, but does nothing for face protection against the handlebars or for overall skull protection should the bike end up on top of them. Look into getting a DOT approved youth motorcycle helmet – they’re less than $100 and are a lot cheaper than seeing your child suffer through pain or long term injuries. How long does it take to charge the batteries on an electric dirt bike? Charging time can vary from bike to bike, but expect it to take at least 4-6 hours. Faster charging can cause the batteries to lose some performance faster, so manufacturers limit the charging speed to preserve battery life. It’s safe to plan on only getting one ride out of an electric motorcycle each day because the charge times in-between are too long. Can I ride this at dirt bike tracks and do jumps? The short answer is no. Of course you can, it’s your bike and you can do whatever you want. However, the suspension on these isn’t designed for it. These are beginner bikes, and they make excellent starter motorcycles, but they are better suited to a lumpy backyard than a motorcross track. Can I ride this on the street? Technically, no. Anything operated on the street (in North America at least) requires turn signals, brake lights, etc. These bikes are designed for offroad use only. However, if your child is wearing a helmet and driving the bike responsibly along residential streets it is unlikely a police officer will have a problem with it. Will these kids motorcycles work on hills? Yes they will. However, there are some variables to be considered. Firstly, how much does the rider weigh? If they are near the maximum weight rating for the electric dirtbike, then it will move slowly up the hill, or perhaps not at all if the hill is too steep. Also, if you are stopped and try starting up a hill that is a much different experience then taking a run at a hill with some speed. Should I get an electric motorcycle or an electric ATV for my kids? Common sense would tend to make you think that 4 wheels would be safer than two, but is it really? According to Reuters Health, people are far more likely to die in ATV accidents than motorcycle accidents. This could be because of increased confidence when riding an ATV causing riders to ride beyond their skill level. Also, ATVs are larger and heavier. Yes they can be very stable, but when turning quickly, falling off an ATV can be deadly. On a motorcycle, the rider is thrown off the bike and the bike tips over. On an ATV, the rider is thrown off, and then the ATV rolls on top of the rider. A key measure against ATV accidents is education. If you are getting a four-wheeler for kids, don’t buy an ATV that is too large for your child, and don’t let a dealer convince you otherwise.